Picking up the guitar at the age of 11, Russi started his musical career playing in local bands throughout his teens in Passo Fundo - Brazil. After listening to the sounds of Trane, Miles and Shorter, Rafael decided to dive into the jazz world and moved to São Paulo where he lived for 3 years. In this diverse cosmopolitan city Rafael was exposed to and influenced by the sounds of the new generation of jazz artists such as Kurt Rosenwinkel, Chris Potter and Brian Blade. Attending Souza Lima Conservatory he studied and played with names like Lupa Santiago, Sizão Machado, Nene, Vitor Alcantra, Daniel Alcantra, Guilherme Ribeiro, among others. His solid development led him to a scholarship to attend Berklee College of Music in Boston. In the U.S, he refined his craft by studying with top jazz artists like Mick Goodrick, Tim Miller, Dave Santoro and Hal Crook. 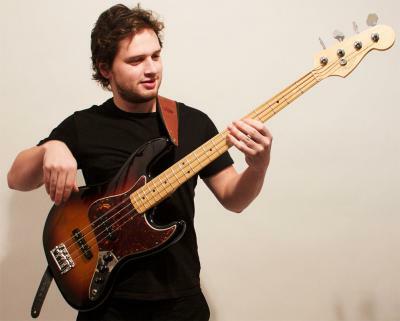 Rafael graduated from Berklee in May 2011 and since than has been playing with different groups and artists such as Hiro Honsuku (George Russell, Mike Stern), Bob Pilkington, Darrell Katz (JCA Orchestra), Gustavo Assis-Brasil, Fernando Saci, Victor Gould, Jonathan Greenstein, Kyle Miles and Ayal Tsubery to name a few. His versatility has also led him to play with singers like Jill Peacock, Tais Alvarenga and Marcela Camargo. Currently Rafael is working on a new project with Mauricio Andrade (Brazillian guitarist). The group will feature a mix of South American grooves, improvisation and a chamber music vibe with arrangements and original music from both Russi and Andrade.